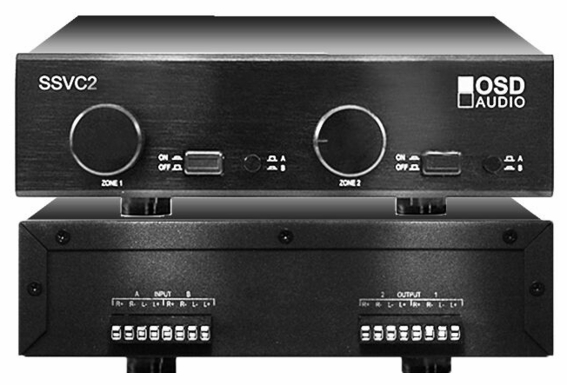 The SSVC2 is low-profile table top volume controls with individual A/B input selectors for each listening zone. The SVC300, a 300 watt autoformer volume control is utilized in each SSVC for uncompromised sound quality and performance. The spring-loaded guillotine-style push terminals accept up to 14 gauge cable. The SSVC’s feature 16 gauge steel construction with our durable black wrinkle powder coating and gray silk-screening. 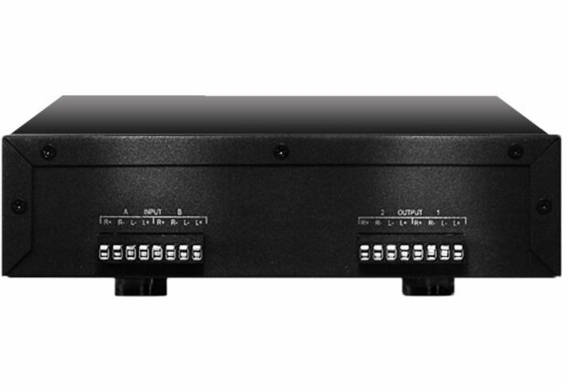 The 8.5" chassis width of the SSVC2 or SSVC1 combines with other 8.5" wide OSD components to make a standard 17" wide unit. Hi, I'm considering the SSVC2 speaker selector to manage playback of two 8-ohm Boston Acoustics RK8T2 rock speakers in my yard. Each of these speakers is wired as a stereo pair and cover two different zones. The speakers are currently being powered by a Denon AVR5600 receiver, which supplies 140 watts RMS per channel (the speakers are rated for up to 200 watts/channel). 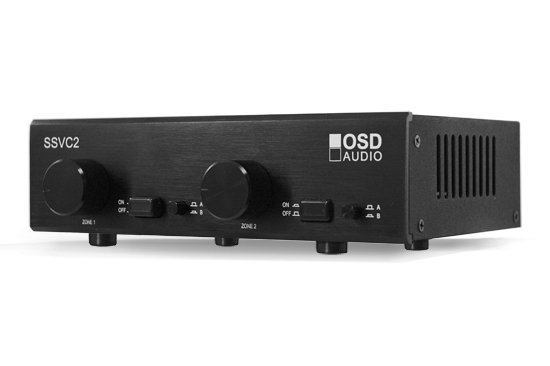 The DSP in the receiver is misbehaving a bit, and so I'd like to change my setup to use the same two amp channels to power both speakers, and to have individual volume control for each zone. The problem I'm running into is that most speaker selectors that include the volume control are only rated for 100 watts RMS, and I'm concerned that the Denon's 140 watts/channel will overpower them. 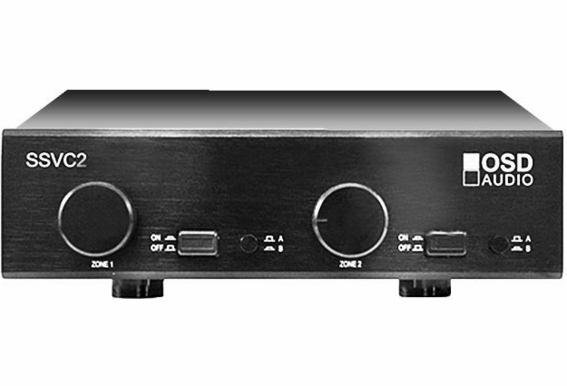 I'm hoping you can clarify the power handling capability of the SSVC2 - the website listing says it supports 300 watts, and the user manual gives conflicting info: one part of the manual says "The SSVC1 SSVC2 & SSVC4 are designed for use with a receiver or amplifier with a maximum power of 180 Watts per channel at 8 ohms respectively", and the Technical Specifications section says that "Audio Power Handling is 100 Watts/Channel peak". What is the actual power handling of this device in relation to the receiver I'm using? On a related note, will using a speaker selector like the SSVC2 be likely to reduce the sound output or diminish the audio quality? I'm looking for the convenience of individual zone audio control, but don't want to give up output or quality. 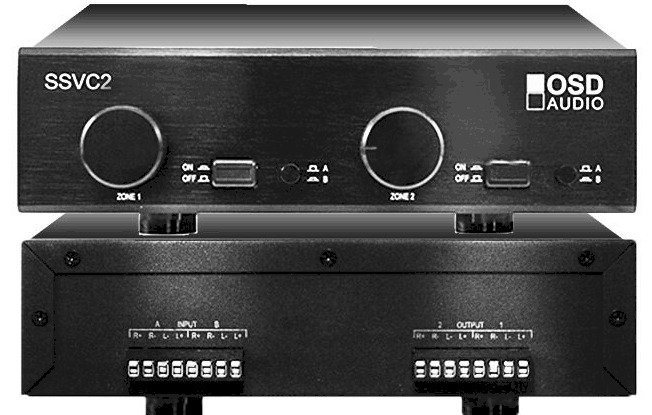 The alternative I've been considering is replacing the AVR5600 entirely in favor of using a new zone 2 amp like your XMP300 or AMP300 model - but those amps don't allow you to control the volume individually per zone, and are also high powered at 150 watts per channel. Any insight you can provide would be greatly appreciated - thanks in advance for your feedback. HI! First, I live in the UK, so you deliver? If so, great! Second question I have a 150 wpc amp with no A/B selector but a pair of stereo outputs (it can run 4 speakers). I would like to drive have the ability to drive all 4 speakers (2 in one room, 2 in another) at the same time, or just in one room or the other (your typical a/b, a+b option set. Is this the speaker selector switch I need? Thanks! I have a outdoor speaker free space 51 and a pair of speaker bose 201 i want ti connect both to a bose ampli bose sa-5 i want to connect both to the ampli and control the volume separtly, Is possible to use the ssvc2, if yes how can i connect? I currently have a pioneer av receiver model VSX-821. It's only connected to 2 Yamaha outdoor speakers(8 ohms) at the moment on the Front L & R. I'd like to purchase an in-wall center channel speaker to place inside(kitchen), but I want to control the volume level individually on these 2 speakers. Will this selector work for my configuration? Also, any suggestions on which in wall speaker to get? I'm a little new to all of this, but I basically need to have the best sound output simultaneously on all 3 speakers. Is there a better way to connect to my receiver? Thanks! I'm really new to all this, so I'm hoping the community can help. I have a Yamaha Rx-V379 Receiver + NS-B40 (Front & Surround) + NS-C40 (Center) + NS-SW40 (Subwoofer). Would this 2 pair speaker selector allow me to connect the 5.1 home theater speakers AND additional speakers and have both pair work? I was reading some additional notes that suggested that by connecting the front speakers for the 5.1, the rest of the system would work when watching TV normally. Then if I was playing music through the system (AppleTV), I could use both sets of speakers? Thoughts and suggestions appreciated. Thanks. Hi, I need more clarifications on the 4 vs 8 ohms thing. I run Yamaha 8" ceiling speakers inside and Bose 151 outside. The sound on the indoor Yamaha speakers is horrible when loud or when deep base is playing. Is this related to the difference in ohms? Also, my amplifier is a Bose SA3 room extender and it can become hot. I unplugged eveything and opened the speaker selector to change the jumpers (as per one of the question/answer on the knowledge base). I noticed that one of the resistor is melted on top. Is the selector fried? I have an Onkyo TX-8020 stereo receiver (50 wpc, 2 channels driven,) with speaker A/B switching. If running A or B speakers, impedance is 4 - 16 ohms/speaker. If running both A and B speakers, impedance is 8 to 16 ohms/speaker. For my A speakers, I am running a pair of Orb Auido Mod2X speakers in my living room, which Orb says are 4 ohms nominal, but also "compatible with all popular receivers & amps rated at 6-8 ohms." For my B speakers, I need to run 2 pairs of Boston Acoustics Voyager 2 outdoor speakers on my back deck, which are 8 ohms/speaker. I'll often want to run the system in A + B mode (i.e., running both the A speakers and the B speakers at the same time). When running in this mode, the B speakers -- the outdoor speakers -- need to be at a higher volume than the A speakers to fill the outdoor space and compete with the outdoor noise, etc., so I cannot control both the A and the B speakers with the Onkyo's volume control (i.e., it'll either be too loud in the living room or too quiet on the back deck). Is the SSVC2 the solution I need? Do I need to run both the A speakers and the B speakers through the speaker selector? If so, will the SSVC4 do the trick? Many thanks! Hi Bryan, The SSVC2 would work, but I just don't know if it's safe to run off that receiver of yours. Typically you want a receiver that is going to be able to handle down to 2-4ohm loads or else it could end up damaging your receiver. I would talk to Onkyo if I were you, and let them know what you're planning to do. See if they think it's safe to run a 2-zone selector off one of those zones. I have a Yamaha HTR-5940 receiver, I want to use this to power 5 different zones in my house 4 zones inside with 2 rectangular in ceiling speakers in each with volume controls, the out side speakers are Omni in ground (green), I would also like to use the Apple air play for iphone/ipod use, I need a speaker selector, or new receiver also? I have a Outlaw RR2150 Stereo receiver that is 100W/Chanel. I have 2 pair of speakers connected to this unit. One pair on (A) and a pair on (B). The pair I have on (A) are JBL-L65 and the pair on (B) are small Bose 301's. Both pairs of speakers are in the same room but I would like to be able to adjust these independently of each other. The reason is, when I have both pair of speakers (A&B) playing at the same time, I can not increase the volume like I would desire to get the bass effect from my larger JBL-L65's without the Bose 301's being to loud. Will your SSVC2 take care of this? I suppose the Remote will no longer function for volume once the SSVC2 is connected. Is that correct? Hi I brought a Yamaha 2020 receiver 9.2 double zone. I am setting 7.1 speaker in my basement and from second zone 2 speaker at swimming pool and 2 speaker at deck. The consultant suggested me Russound SDB 2.1 to split the 4 speaker out side from second zone. Somehow I want to buy SSVC 2 from this website as this is much better price. Will this work exactly as Russound sdb 2.1. pl advise. I have what I think is a fairly simple question but I am unsure about it. I have a 5.1 yamaha receiver (no A/B speaker setup) and want to hook up a couple of outside speakers on my lanai. Can i use this box to input the two left and right front speaker wires from the receiver to the A side and output to the 5.1 setup and two outdoor speakers? thank you. My reciever is currently running my surround sound plus a pair of patio speaker. I am looking to add another pair of out side speaker with the ability to turn the patio speaker down with the new pair remaining loud. Will this product work for that? I noticed on the back it has 4 inputs and four speaker outputs. I will be using only 2 of those inputs will it still control all outputs for 2 pair of speakers like i want? If not is there another product you would recommend? i have two questions about this. What if i am using one pair of 8 ohm and 1 paird of 4 ohm speakers. Also is i amd coming out of a mixer and want to go to the speaker selector than two amps will the selector work for that. I am setting up a whole home speaker system for a day spa, they want all of the rooms to project the same music. Picture relaxing environment. :) Will this work for a 5 room home, with at least 5 different speakers? Probably more along the line of 8 speakers. 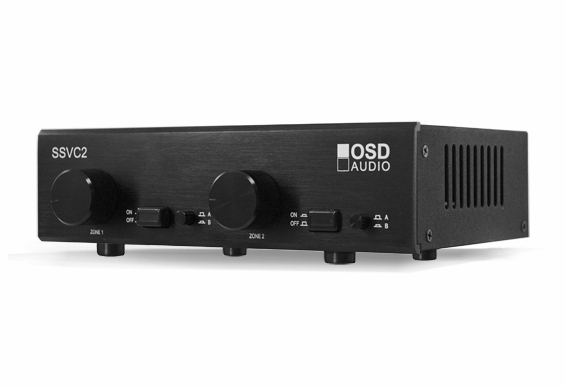 I'm looking towards the purchase of this item but I have a question: my home receiver has a second zone option and this is gonna be the output to the speaker selector. My concern is that my receiver outputs 90 w per channel and I'm don't know If this speaker selector will be damage the receiver(because of the 300w).